This entry was posted on 8.3.2015, in Articles in English and tagged animal training, horse behaviour, horse training, how does the horse learn. Bookmark the permalink. The different ways in which horses and other animals learn has been the subject of study for decades. Thanks to this we nowadays have a very comprehensive understanding of the learning process of horses and other mammals. Animal trainer Tuire Kaimio conducted a clinic specially targeted for people working with horses. 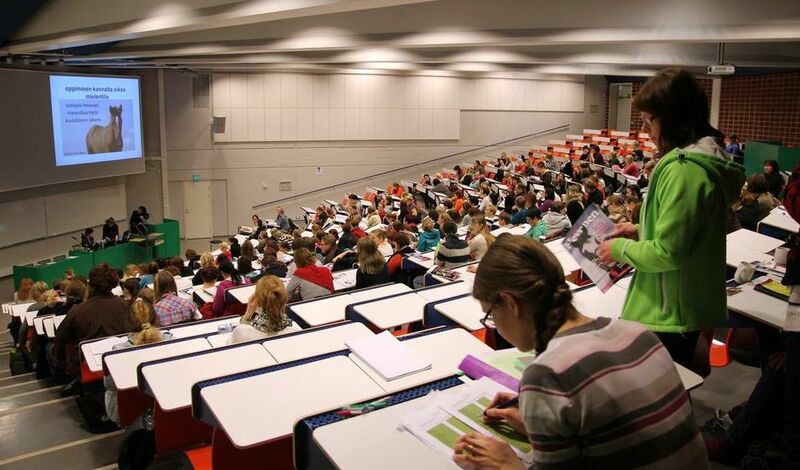 The two-­day clinic saw over 250 participants gathered into the lecture hall of the University of Oulu to hear Kaimio lecture about the latest information on species­specific behaviour and learning of horses. 150 participants also had the chance to attend the practical demonstrations. In order to be able to train an animal, the trainer must first know the species-specific behaviour of the animal in question, animal trainer Tuire Kaimio says. The species-specific behaviour of equines has been studied for decades and, as a result, the equine behaviour patterns connected to certain situations are well known by now. Luckily for equine oriented people there is no need to reinvent the wheel and try to guess what the horse might be signalling with its behaviour, as there is a vast amount of information available on the matter. However, Kaimio noted, when interacting with humans, horses also show certain behaviours that are not at all encountered in feral horses. Some of this behaviour is caused by training, some by living conditions. Unfortunately, the majority of the behaviour that is presented only when interacting with humans is stress related. According to Kaimio, studies show that horses exhibit even more stereotypic behaviour than hens kept in battery cages. Although the basic behaviour patterns are innate, they are affected by experience and can be shaped by training. Kaimio noted that every encounter between horses and humans include some training, whether we want it or not, because horses learn all the time. In all our actions, the rules of human and equine learning are actively at work in the background whether we recognise it or not. Sometimes a horse behaves in ways that humans find incomprehensible or surprising. The thing which guides a horse in its behaviour, regardless of the situation, is always what, from the horse’s point of view, is the most rewarding or beneficial to it. According to Kaimio, in efficient training the trainer uses the things the horse considers rewarding as reinforcement. During the practical demonstration the horses were trained by using negative reinsforcement, ie. releasing a touch or an aid at the moment the horse showed the right response. In some cases food rewards were also used and in these cases the horses were first taught how to behave politely when given food rewards. As soon as horses began to understand that a certain behaviour would consistently lead to a meaningful reward they began to show a rapid increase of that behaviour pattern. A reward could also be making the situation somehow easier or more comfortable for the horse, granting access to other horses or scratching the horse, for instance. Whether the desired behaviour begins to increase or not helps the trainer to determine if the horse considered it a reward or not. Punishment also changes the horse’s behaviour. Using punishment means that every time the horse behaves in a specific undesirable way something happens that the horse considers unpleasant. A well-timed, consistent punishment may, at least momentarily, suppress undesired behaviour. A punishment can be preventing the horse from getting something it wants, such as food or the possibility to join the other horses. If a certain behaviour always has a certain consequence such as the rider closing the hand on the reins that would also work as a punishment. However, Kaimio wanted to remind the trainers that using punishment in training causes certain problems. One of the problems when using punishment is that it does not give the animal any clue to what it should be doing instead. All forms of punishment also decrease the horse’s willingness to make an effort, it’s activity and also diminishes the horse’s responses. If the goal is to train a horse that moves willingly, with great expression and eagerness, one must try to avoid punishment in training. Punishment also easily leads to frustration, stress and fear – all things that hinder learning and affect the animal’s well-being. According to Kaimio, any form of punishment that causes fear or pain should be avoided at all cost, because horses can learn in just one repetition to associate those feelings with anything present at the moment, including people. If this happens, the horse will get anxious every time it is trained or even when it is approached by a human. Kaimio compares the use of punishment and rewards in training to the familiar game in which one person waits outside a room as the others hide an object somewhere in the room. As the person enters the room and begins to search for the object, the others guide the searcher by saying “getting warmer” or “getting colder”, respectively. Warmer means that the person is getting closer to the object and colder means that they are getting further away from it. The more the person hears “getting hotter” the more enthusiastically they will keep on searching, and soon find the object they are looking for. If they would hear only “getting colder” all the time, it would just remind them of their mistakes without giving them any information on what they should try to do. Sooner or later the lack of positive feedback would become too discouraging and the person would end up completely discouraged. A well-known dog trainer, Tommy Wirén, has described the same thing by comparing it to a taxi ride. Wirén says that it is far more productive to tell the driver where you want to go instead of listing all the places you do not want to go. Kaimio reminded the spectators that the core element in animal training is the correct timing of the reward. If a horse gets the reward at the exact moment when it is performing the desired action, it will learn quickly. If the reward comes a second too late, the horse will still learn but it will do so slowly. If the reward comes five seconds too late, the horse will no longer learn the right behaviour at all. It is also very important that rewards are given only for the desired behaviour. If a rider or a trainer accidentally also releases the aids when other behaviours occur it will become difficult for the horse to understand what it is expected to do. The horse will begin to increase all the behaviour that has resulted in the reward. For example if a horse’s lack of response to an aid results in the release of the aid the horse will soon try even harder not to react. However, there are some situations and daily routines, such as saddling, in which it is useful to reward the horse for standing still and not reacting at all. Kaimio also reminded the participants that whenever one is observing two different trainers, instead of simply thinking that the trainers are repeating the “same” movements, it is much more fruitful to pay attention to the most important thing: what is it exactly that is rewarded? This is what teaches the horse. The practical demonstrations offered a very good example on correct timing. One of the horses was trying to avoid rein contact by constantly chewing the bit. The horse was asked to flex laterally at the poll, keeping the neck straight. At the beginning of the training session it was enough that the horse gave the flexion and kept its mouth still and closed. As the training proceeded, the task was made more demanding and the reward came only as the horse, due to the flexion, relaxed both its neck and its jaw. Later, as the same exercise was done with a mounted rider, the horse soon maintained a soft contact with the bit. 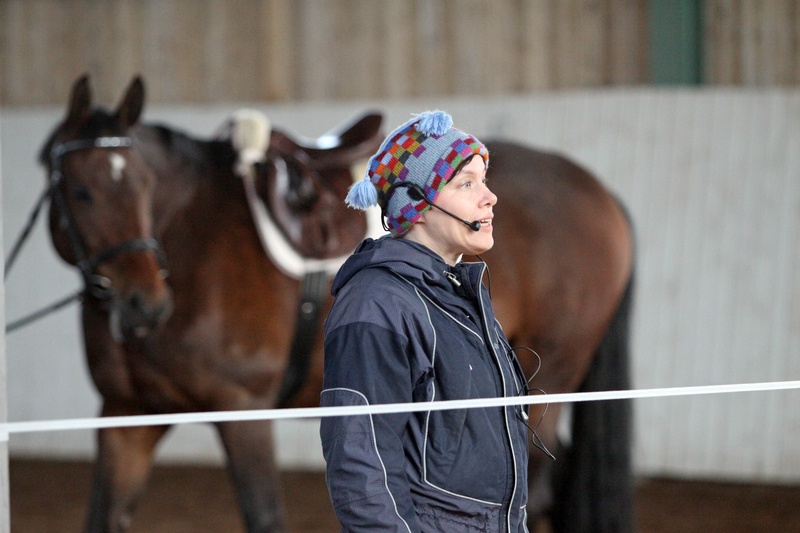 Viivi´s practice was the relaxed flexion of the head with her trainer Mintti Rautioaho. Shedding light on learning theory gives explicit explanations to many of the questions constantly found in training horses. Sometimes it is difficult to understand why the training is not progressing or why the horse is suddenly not doing something that it has already learnt earlier. A criteria means that in every exercise the trainer has a clear idea of what the horse will be rewarded for. If the trainer doesn’t know exactly how the horse should behave and move, it is impossible for the horse to learn. 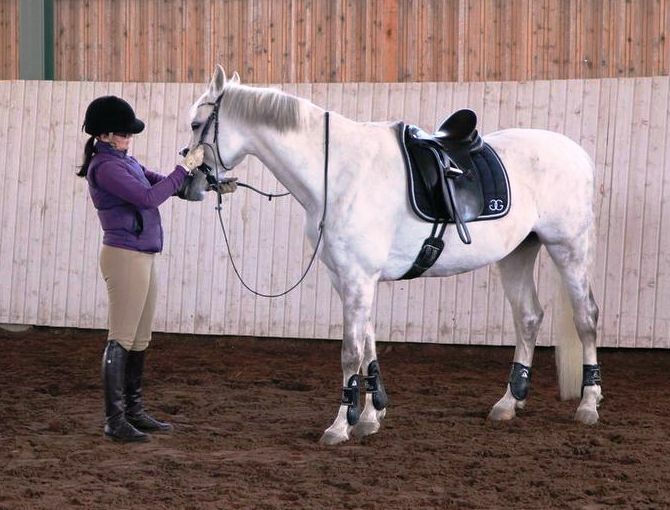 Selecting the right criteria has a significant effect on the horse’s learning process. When teaching something new to the horse, the criteria should be set so low that the horse has a possibility to succeed, and thus be rewarded (e.g. by the release of an aid), at least every five seconds. A slower rate lessens motivation and adds frustration which slows down learning and might also cause the horse to get anxious. One of the most crucial skills a trainer needs is to be able to divide all tasks into smaller sections. This is the fastest way to train a horse. Kaimio reminded the audience that one or two correct responses do not yet mean that the horse has really learnt the new task – it is more of a coincidence. Only after eight consecutive correct responses it can be said that the horse has understood the task. That is also the right time to raise the criteria slightly. Lakora was practicing backing-up while keeping her head low with her owner Annukka. Should the criteria be raised too soon, the horse has not had time to learn. On the other hand, if the criteria remains the same for too long, the behaviour will become fixed and it will be difficult to modify it further. A skilful trainer knows exactly when and how much to raise the criteria, keeping the training at its most effective. You can recognise good training when the horse’s expression and movements are calm and the horse tries to execute the tasks asked for in an active and focused way. This also means that the horse is continuously learning. Every time when being trained the horse should cleasly be progressing. It is also essential that the horse is taught one thing at a time. According to Kaimio, it will take a horse about ten minutes to learn a simple task, given that the task is not too difficult for the horse and the conditions are suitable for learning. 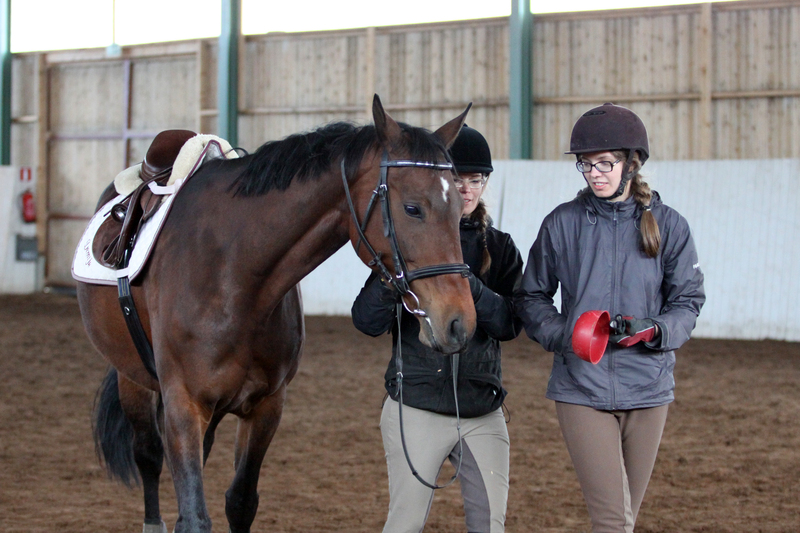 If a trainer is trying to reinforce three different things at a time, it may easily take months for the horse to learn them. Not to mention if a trainer is trying to teach the horse six things at the same time, in which case the horse might never learn them. Does the Horse Know How? Kaimio defined the horse knowing how to do something as follows: When the horse performs the task from a cue or aid immediately and every time it is asked to do so. If this is not the case, the horse needs more training. This was always tested in the practical demonstrations: all horses’ reactions to each aid was first tested and if any deficiencies were noted the aid in question was re-trained. It was only after this that the aid was used in training new skills. 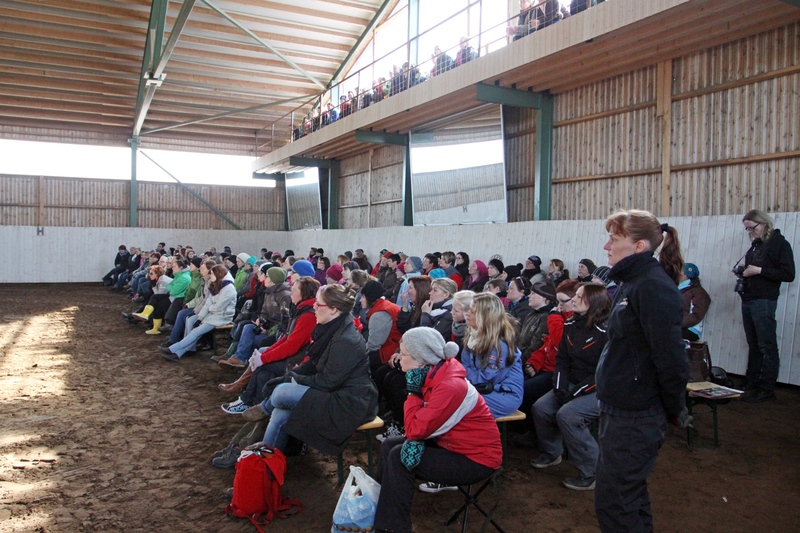 The attentive audience in the riding-hall of Korpela-stable. For a certain behaviour to become established at least 20 successful repetitions is needed in order for it to begin to remain in the horse’s long-term memory. In addition to this, some finished behaviours (e.g. standing still when a rider is mounting) need to be reinforced countless times in different situations for the horse to reliably obey regardless of the surroundings. When teaching a new skill frequent breaks are of essential importance. Learning will be most effective when a short break is given every five minutes. One can, of course, continue longer without any breaks, but this will significantly prolong the time it takes for the horse to learn. According to Kaimio, many horses can learn efficiently for as long as seven minutes at a time but it is us humans who, after five minutes, start to make so many mistakes that it will interfere with the training. 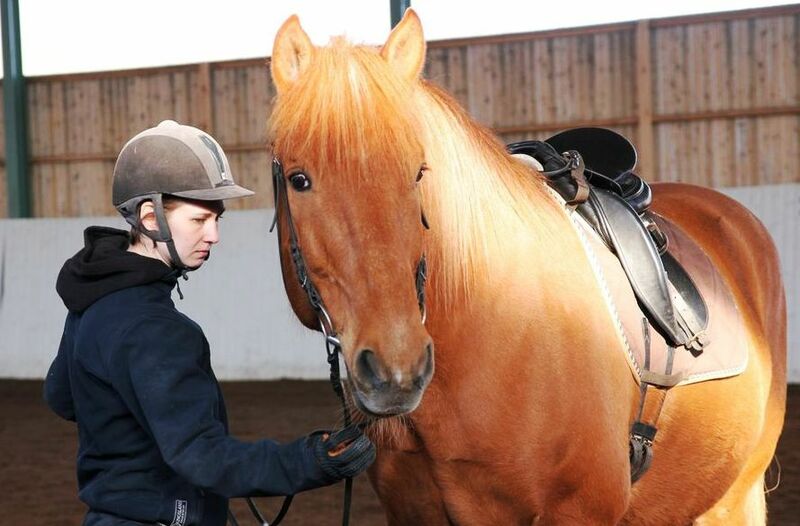 Kaimio emphasised that all trainers should note that, in addition to the behaviour being taught, an animal always learns the emotion associated with the task at the moment of learning it. It is of utmost importance that the horse is completely calm and relaxed when it is learning a new skill. This doesn’t mean lethargic or passive, only relaxed – activity is useful in many situations. Skills that the horse has already learnt can naturally be asked for in more challenging situations, too. 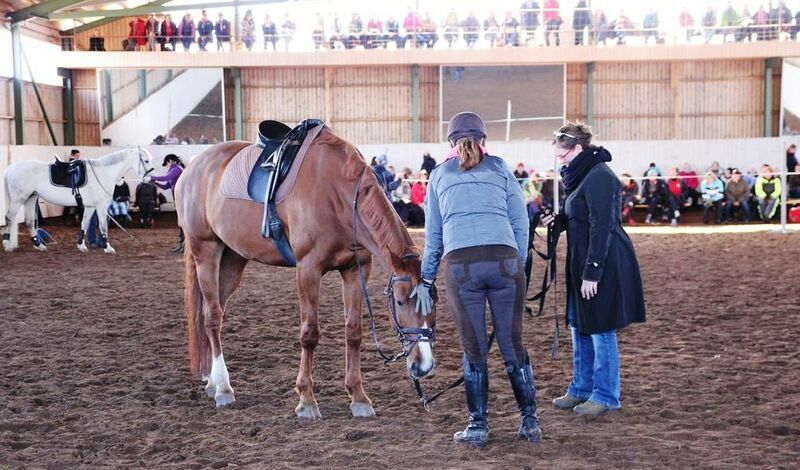 During the practical demonstrations we saw a horse who, due to previous pain, had learnt to avoid all movement. For a long period of time the riders, unaware of the horse’s discomfort, had tried to get the horse to move. As a result the horse had learnt to resist all aids aiming at increasing movement. This behaviour had not stopped although the horse was now pain free. With this horse, Kaimio opted for a more unusual training method, target training, to help the horse find a voluntarily forward movement. 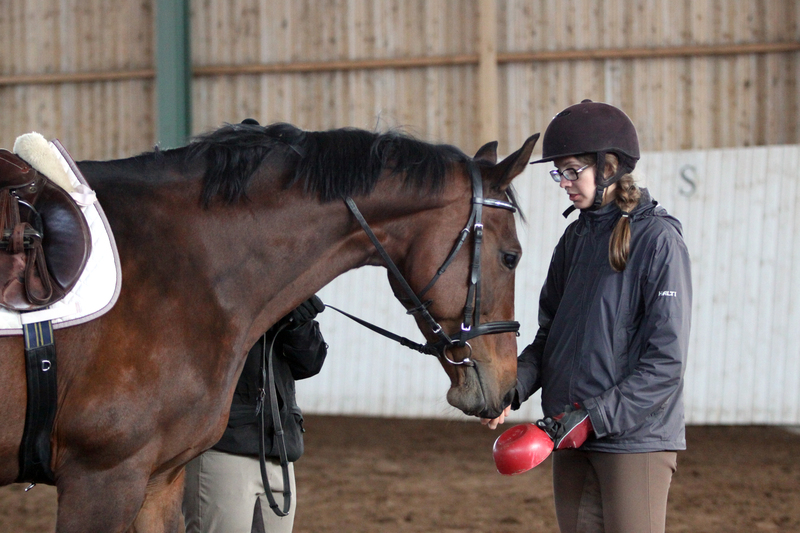 Prior to the demonstration, the horse had been taught to touch a red plastic scoop and as the horse was now taught to follow the scoop its movement became more active and relaxed and was rewarded. Iida, Anni and Mimmi following the target-scoop. To train the horse the transition from walk to trot, some luring was used. Kaimio was walking next to the horse, moving in the same rhythm with it and then she softly started to run. In the manner typical of herd animals, the horse simply started to mirror her movement. This was another way to produce a voluntary, cadenced movement which again was rewarded. After this, the rider’s light leg aids were added and after a while no other aids were necessary. At the end of the session the horse was moving forward actively and willingly in a good balance, without any resistance, from the lightest of leg aids. In training, stress should be avoided at all costs. If the hyper-arousal related to stress becomes a learned part of an everyday task such as riding, it has a major influence on the well-being of the horse as well as its capacity to learn. Daily stress also subjects the horse to the dangers of long-term stress in which case the body never has the chance to recover but is on constant overload. In horses, it takes just 15 minutes for stress hormones to release into the body but on the average between 3-8 days for them to disperse. If the horse undergoes another stressful situation during these 3-8 days and is exposed to another dose of stress hormones it has no time to recover but is chronically stressed. Kaimio presented quite a list of symptoms caused by long-term stress. These included learning and memorising difficulties and lack of ability to focus; impulsiveness and overreacting, and atypical behaviour. In addition stress destroys brain cells at least temporarily and exposes the horse to a variety of physical ailments. Stress can also cause problems in humans, such as burn-out, depression and other stress-related ailments. Momentary stress does not present a problem. If a horse is only occasionally exposed to stress and it doesn’t get rewarded for the stressed behaviour, accidentally nor consistently, it won’t learn stress as a permanent part of it’s behaviour. It is, however, vital for a trainer to be able to recognise even the smallest signs of tension so that the training situation can be modified so that fear does not become associated with the skill that is being trained. During the demonstrations, even the slightest whisk of a tail, grinding of teeth, tossing of head and restless movements were noted as important signs of tension and anxiousness. According to Kaimio, it is essential that nothing new is being taught to the horse during those moments of tension, instead rewarding the horse when it is relaxed. If the horse never performs a task while remaining relaxed, the horse has either learned to associate tension with the task or the task may be too difficult for the horse. A recognisable characteristic of learned tension is that is always shows in the same manner in the same situation. A normal, spontaneous fight or flight response is momentary and transient, and the reaction and associated body language are dependent on the cause. In the case of learned tension, the reaction can be completely disproportionate, always occurs in the same situation, and the response is always the same. With learned anxiety the only possible solution to the problem is to re-train this to the horse from the beginning. Re-training should begin from such elementary steps that the training can be done without any signs of anxiety. During the demonstrations the participants got the chance to follow the re-training of a horse that had learned to fear the whip. At the lecture Kaimio used the same horse as an example of learned anxiety by showing a video in which it was clearly visible how the horse got anxious each time it was touched with a whip in order to ask it to go forward. In the demonstration the owner of the horse began the re-training by desensitizing the horse to the touch of a whip so that the horse remained calm and relaxed regardless of where it was touched. After this was successfully done it was time to re-train the whip aid by starting with the lightest possible touch and rewarding the smallest effort of moving forward by releasing the whip aid, i.e. ceasing to touch the horse with the whip. The learning process went well and in a short time the horse had learned to move forward from a light tap of the whip while remaining perfectly calm. At the same time the horse was also trained to stop when being stroked with the whip. Many horse owners find it strange is that many horses seem to respond to the aids well in some locations and not well at all in others. Kaimio said that the explanation for this is because unlike humans and many other animals, horses are actually rather slow to generalise. At the beginning of training the horse will associate the task in question specifically with the location where it is taught. From a trainer’s point of view it is good to know that when a horse has learned to perform a task in a certain place and from a certain aid or cue it will still require a lot more training to get the horse to reliably perform the same task in a different place or from a different aid or signal. For example, many dogs learn to generalise an aid or a cue to apply anywhere after it has been practised in four different locations, Kaimio said. For a horse this is usually not enough, it will need more training to generalise. After a horse has begun to learn a certain task or an aid, a trainer has to be sure that the essence of that task or aid remain the same, but everything else has to be changed as much as possible. This is to ensure that the horse really learns the aid itself, not just whatever position the person beside it is standing in. It Will Get Used to It – Or Will it? 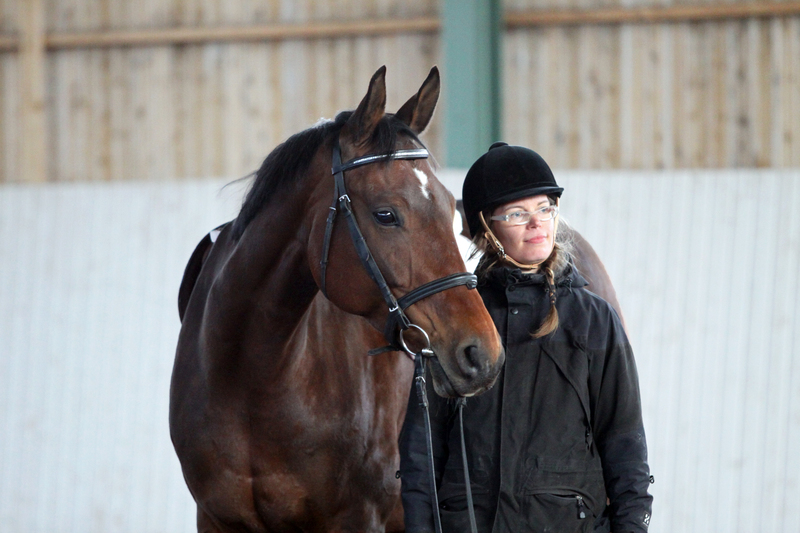 During the lectures Kaimio discussed in detail equine behaviour in threatening situations. Usually the horse reacts to new things by first becoming slightly tense and preparing for possible flight. In case the new thing turns out to be relatively safe the horse becomes curious relatively soon; it will approach the subject, examine it and find it harmless. Crossing the fear threshold, however, will result either in a defence response or a slow or fast flight response. If the cause of alarm does not give chase or become bigger the next reaction will be another attempt to investigate, only this time from a safer distance. Recognising this flight response is crucial in training a horse, says Kaimio. When a new stimulus doesn’t cause fear or flight, a horse usually gets used to it quickly and after a while does not react to it in any way. If the flight or fight response kicks in and the horse reacts to the stimulus by trying to escape or defend itself, it will not be able to habituate quickly. It doesn’t help to forcefully subject the horse to the frightening stimulus or teach it to stand still despite the fear. The horse might learn to stand still but the stress levels will remain high unless the horse is given a chance to familiarise itself with the stimulus. Not only does the horse learn to fear being restrained but it may also develop other ways to cope with the situation. The most unfortunate one of these is learned helplessness, which means that under high levels of stress the horse becomes completely unresponsive, as all other behaviour is blocked and hindered. Unresponsiveness, however, is abnormal and is associated with an extremely strong and harmful state of stress. The situation may also resolve in some surprisingly fierce reaction if the horse simply cannot take anymore. Kaimio advised that in frightening situations it would be important for the horse to have been taught a variety of skills that have become associated with calmness. When the horse gets anxious, performing these tasks helps it to behave more calmly even in frightening situations. One horse participated in the demonstration because of its strong fearful behaviour. With this particular horse the audience had the chance to participate in the training. The horse was trained using the idea that the brain can learn to override fear. 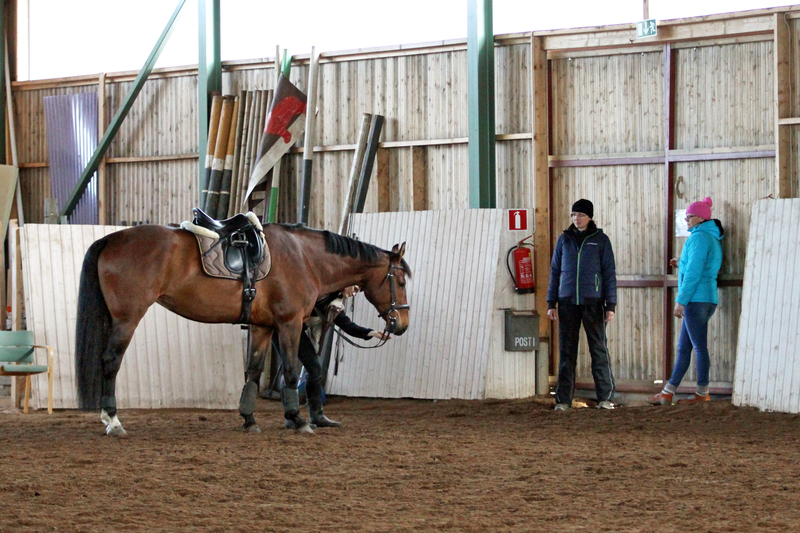 The training began with the horse being brought into the indoor arena, as far away from the audience as possible. First the horse was asked to perform a familiar task of lowering its head with a light pressure on the poll – a skill that the horse had learned to associate with calm. 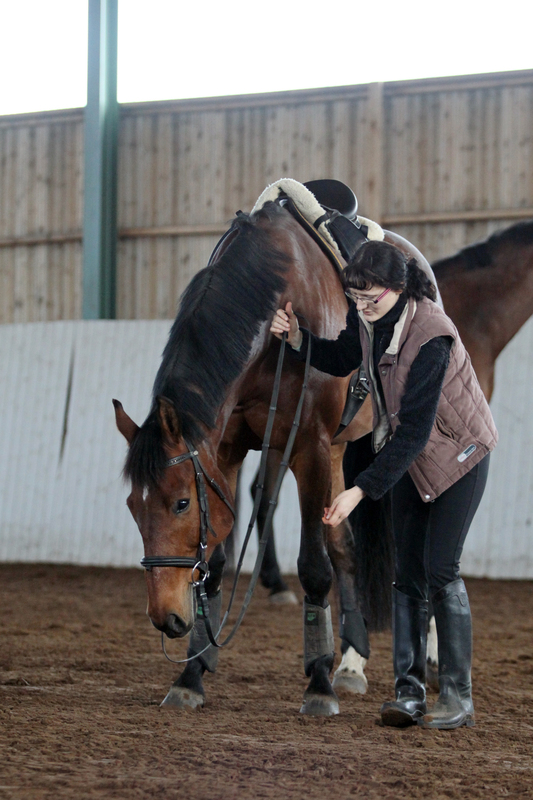 Chapri is practicing lowering the head with her owner Salla Korpela. After the horse remained calm, the audience was asked to produce a bit of a noise and stop at the exact same moment the horse lowered its head. The 150 strong audience was extremely well focused on its task. As the horse became desensitised the noise level was gradually increased, and the right timing of the silence made sure that the anxiety began to turn into a relaxed coping strategy for the horse. If, in the same situation, the horse would have simply been brought so close to the audience that the horse’s fear threshold was crossed, the horse would not have desensitized. Instead, fear would quickly turn into a learned response in similar situations. If the situation would, in addition, have included intentional or unintentional punishment or if the humans would have behaved in a manner impossible for the horse to understand, the fear would only have grown stronger.